Cognitive computing could soon be coming to Japan after the announcement from SoftBank of a partnership with IBM, bringing the ‘brains’ of IBM’s supercomputer Watson to SoftBank’s social, friendly personal robot called Pepper. Watson has been under development at IBM since 2006 and is a giant, room-sized computer able to process vast quantities of information to produce artificial intelligence. Since being publicly introduced in 2011 Watson has been able to learn enough to beat the top grand champions from the Jeopardy game show. IBM and SoftBank will now be working together to programme Watson to be able to speak, listen and think in Japanese. Pepper was introduced in June of last year and through repeated interactions with humans is able to recognise and analyse tones of voice and facial expressions to identify and understand emotions. As a board member of SoftBank Capital PrinceVille Investments and with broad experience of investing in technology start-ups and innovative tech companies, Mukesh Valabhji is particularly interested in what this collaboration could mean for the role of technology in business and the global impact that this will have. Mukesh Valabhji serves on a number of boards on top of his position with SoftBank PrinceVille Investments, including Crimson Investment. He has also established several of his own companies throughout his life, from the Seychelles Marketing Board to his latest venture, Capital Management Group. An entrepreneur and professional investor, Mukesh Valabhji has interests in large numbers of properties in several countries, from Samsung Hub and the Finexis Building in Singapore to the latest luxury resort and spa complex in the Seychelles under the Six Senses brand, due to open to the public later this year. It is anticipated that robotic technology will become more commonplace and that we will gradually begin to incorporate it into many facets of our lives, including our homes as well as places of business. This will require engineers to develop new ways to present this technology to consumers, ensuring that our interactions with the AI are perceived positively. Pepper is a personal robot designed to become a genuine companion to owners. Standing at 1.2m tall, Pepper has a wheeled base, two arms and a 10.1 inch tablet screen mounted in the chest area. He was created with the aim of making people happy through positive interactions – a social rather than functional household robot. The main goals of Pepper as he interacts with humans are to help people grow emotionally, facilitate relationships, well-being and kindness and have fun while encouraging contact with the outside world. The name ‘Pepper’ was chosen to express a sparkling personality and facilitate ease of pronouncement across a variety of global languages. While in the minds of his makers robots are genderless and people are able to project a male or female persona onto Pepper as they wish, in the SoftBank shop Pepper is referred to as ‘he’, being more personal than ‘it’. At present Pepper can speak four languages – Japanese, English, Spanish and French – although makers Alderbaran will shortly be introducing more languages as well as new behaviours and additional capabilities to further facilitate interaction. 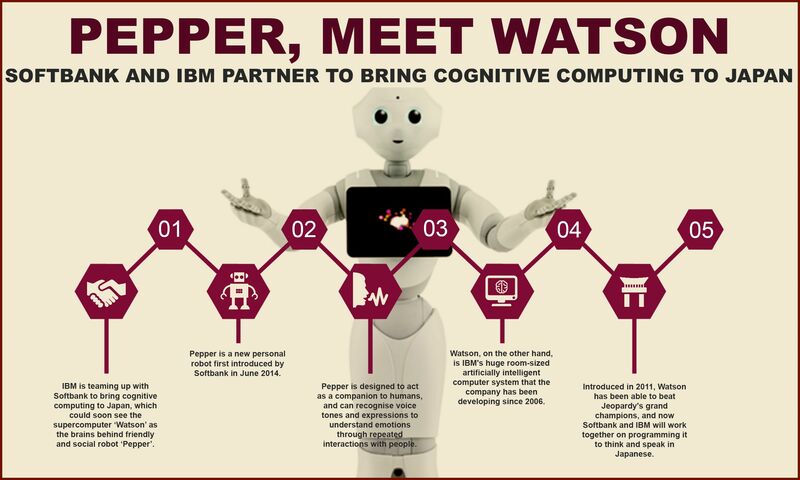 The partnership with IBM enabled Pepper to speak Japanese. Watson is IBM’s huge cognitive computer built to mirror the learning processes of humans, being a cognitive framework that combines observation, interpretation, evaluation and decision-making. Watson is able to take in huge amounts of data from all the sources humans use to communicate, from Tweets to comprehensive research reports. The difference between Watson and humans is not how that information is processed but simply how fast – Watson is able to process vast quantities of information in seconds without being bound by memory or volume. The main challenge now is getting Watson to understand the Kanji Japanese written system, which contains 6,879 graphical characters. Watson will begin by being ‘taught’ an annotated set of quarter of a million words, which it will then transform into 10,000 diagrammed sentences – where the subject, verb, object and context are identified. Following this any mistakes made by Watson will be corrected and a further 250,000 words taught, with Watson able to learn from its past mistakes. Once a million words are fully understood, researchers will be able to help Watson understand the language and how it should be used in its entirety. The collaboration between Watson and Pepper will initially fulfil specific business needs and demands, principally in the fields of healthcare, banking, education, insurance and retail. While consumers in the west have been more reluctant to embrace new AI technology in the home compared to those in Asia, the potential for their use in commercial environments looks much more promising. The Japanese multimedia and telecommunications giant SoftBank Corp. announced in May of this year a planned series of changes designed to transform the company from a strong Japanese business with control of global assets into a truly global corporation with the aim of creating sustainable long term growth. The changes will include taking a systematic approach to the ongoing support of the diverse group of entrepreneurs and transformation of operating assets currently in place among other things. Chairman and CEO Masayoshi Son commented that this bold move, which will likely take several years to fully implement, has come about to combat the fact that many technology companies begin to face decline after the first three decades due to over-reliance on founders and an inability to keep up with changing business models and evolving technologies. On June 19th Nikesh Arora moved from his position of SoftBank’s Vice Chairman to take over the new roles of President & COO and Representative Director. SoftBank will remain under the leadership of Masayoshi Son while the domestic telecommunications business of SoftBank Mobile Corp will continue under President and CEO Ken Miyauchi. 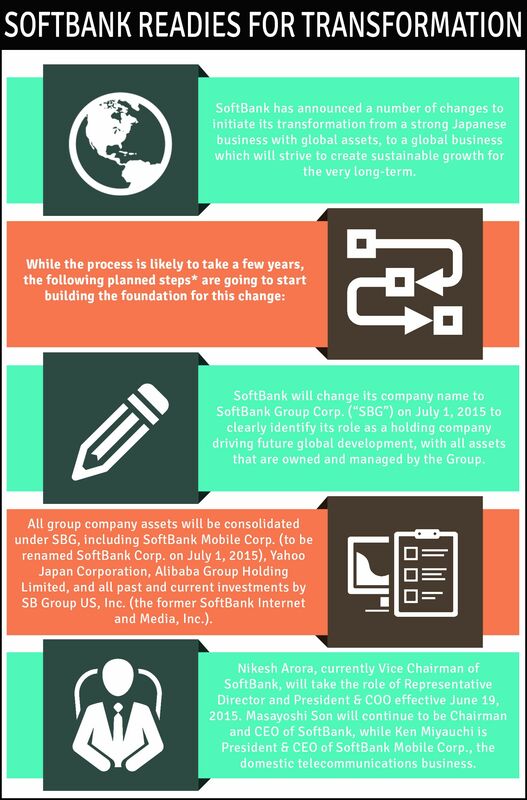 On July 1st SoftBank Corp. changed its name to SoftBank Group Corp. or SBG, in order to clearly identify its new position as a holding company seeking to drive future developments on a global scale, including all assets managed and owned by the Group. On the same date all group assets were consolidated under the SBG brand, including SoftBank Mobile Corp., Alibaba Group Holding Limited, Yahoo Japan Corporation and all other investments of former SoftBank Internet & Media, Inc. (now known as SB Group US, Inc.) both current and past. Mukesh Valabhji is a Seychellois entrepreneur and investor with a number of past and ongoing business interests across the world. As a member of the board of SoftBank PrinceVille Investments, this work has led to his interest in other technology start-up companies. Mukesh Valabhji also serves on the Advisory Board of Crimson Investment alongside his numerous other activities. In 1985 he founded the Seychelles Marketing Board, serving as Managing Director for some 21 years before stepping down to form his current enterprise, Capital Management Group. In its heyday the SMB brought in some 20% of the GDP of the Seychelles and was the single biggest employer and enterprise in the country. While Mukesh Valabhji has business interests across the globe he remains prominent in his home country, spearheading or advising on a number of investment and entrepreneurial activities. These include Intelvision, one of the largest providers of internet, broadband, VoiP, telecommunications and cable television in the Seychelles and the Intelvision Building. A group of offshore investors being advised by Mukesh Valabhji are currently funding the soon to be opened Six Senses luxury spa and resort on the private island of Félicité later this year. Outside of his home country Mukesh Valabhji is a prominent investor in commercial real estate and property, with investments including the Building by Daman in Dubai, the Samsung Hub building in the financial district of Singapore and a range of further commercial properties, hotels and retail malls in a variety of countries. SoftBank PrinceVille Investments, of which Mukesh Valabhji is a Board Member, focuses on providing funding and local market expertise and support to tech companies at the growth stage with its latest £250 million fund. The main aim of the Fund, which closed in February 2013, is to encourage innovative technology companies across sectors such as social media, consumer and enterprise mobile, e-commerce, cloud computing and online advertising, to expand into the rapidly growing Asian market backed by strong partners such as Yahoo Japan and the Alibaba Group. SoftBank has already begun to make a rapid series of investments across Asia that reflect its growing interest in going global and make it increasingly difficult for the company to be seen simply as a Japanese telecom business. Recent investments include $1 billion into Coupang, an e-commerce leader based in Korea, $210 million and $627 million respectively for India’s Ola and Snapdeal, $600 million for Kuadi Dache in China and $250 million invested in GrabTaxi operating across Southeast Asia among others. With the plans for global transformation well underway, investments such as these solidify the position of SoftBank as a respected global investor with international potential. Japan’s SoftBank has been on a global spending spree in recent months, in particular in autumn of last year when the mobile giant invested almost USD$1 billion in the space of just six weeks into companies outside of Japan. 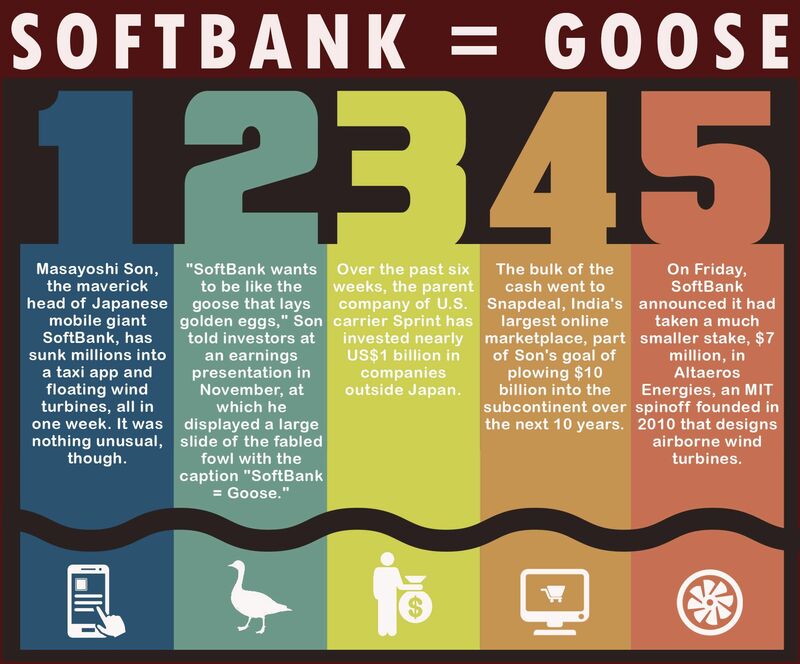 Maverick CEO Masayoshi Son spearheaded the series of investments after having told investors at an earnings presentation that he wanted SoftBank to become like the goose that laid the golden egg. Working on predictions that India and China will become the top two economies over the next few decades, SoftBank invested approximately a billion US dollars in companies in those two regions over a short space of time and has announced plans to sink as much as $10 billion in Indian enterprises over the next ten years. The largest investment from the November spree was the $627 million for Indian online shopping portal Snapdeal. Son pointed to the huge success of SoftBank’s investment in Chinese shopping portal Alibaba as inspiration for this, noting that the $20 million share purchased in 2000 was valued at around $86 billion in September of last year. SoftBank has also invested $460 million in two taxi apps – GrabTaxi and Ola – and $7 million in Altaeros Energies. Altaeros is an MIT spin-off designing kite-like airborne wind turbines. While in the grand scheme of things this investment is relatively small, a spokesman for SoftBank stated that it would likely open up further opportunities. The devices, which generate more than double the amount of electricity of similar sized turbines on the ground and stay aloft at approximately 2,000 feet, have the potential to lift other equipment such as telecommunications into the skies. This potential for combining with telecommunications or surveillance technology could be the beginning of big things for the mobile giant. The venture arm of SoftBank is also making a series of investments in technology growth-stage businesses through the $250 million PrinceVille Fund. The Fund, managed by a board including Mukesh Valabhji, will be providing between $10 and $20 million to twelve to fifteen companies looking to expand into the Asian market, with focus on areas such as cloud computing, social media, gaming, ecommerce, mobile apps and online advertising. The companies in question will also be able to benefit from the vast network of investors, advisors and vendors under the SoftBank umbrella throughout Asia. Mukesh Valabhji brings a wealth of investment experience to the table, including in telecommunications and media with the Seychelles cable television, VOIP and broadband company Intelvision and in prime commercial real estate, hospitality ventures and trading across the globe. Under the leadership of Masayoshi Son, SoftBank has been able to announce that net income for the six month period leading up to September 30th 2014 was already up 37% from the same time period the previous year. Some of the most successful investments spearheaded by Son include cumulative investment in internet companies including Yahoo Japan, GungHo video games and UTStarcom telecommunications infrastructure, turning USD$3.2 billion into $96.7 billion. While critics have pointed to the disappointing performance of recently acquired US carrier Sprint Corp, Son remains unruffled, stating that his style of decision making is based on forecasts for the next ten, twenty or even thirty years. The man who introduced the iPhone to Japan has never been afraid of taking risks and this can be seen in the plans to sell Pepper, a ground-breaking robot for domestic communications, for only a similar price to that which you might expect to pay for a high end PC next year. Pepper, developed by Aldebaran Robotics, has been working for the past few months as a retail assistant, helping to sell Nestle coffee machines and the brand new iPhone 6 in Japan. Masayoshi Son was named 45th in the 2013 list of the World’s Most Powerful People from Forbes Magazine. He has a personal fortune of $13.6 billion, making him the second richest person in Japan, despite having the dubious distinction of being the individual who has lost the largest amount of money in history in 2000, when the dot com crash cost him approximately $70 billion. The maverick CEO is also known for his environmental concerns and philanthropy. After the Fukushima Daiichi nuclear disaster, Son engaged in huge investments in solar panels across Japan and publicly criticized the nuclear industry, while in the wake of the 2011 Tohoku tsunami and earthquake Son pledged not only an immediate ten billion yen to support victims but also his own remaining salary until the date of his retirement. See our next post about Mukesh Valabhji exploring planned SoftBank transformation. 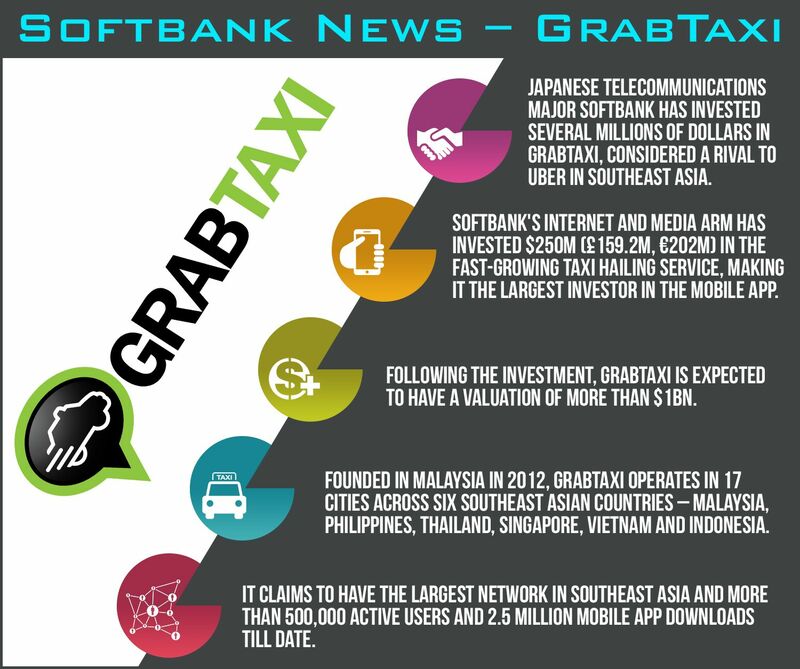 GrabTaxi, founded in 2012 in Malaysia, has become the latest investment of Japanese internet and telecommunications giant SoftBank. The internet and media arm of SoftBank has sunk $250 million into the taxi hailing app, making it the largest investor to date and taking the estimated value of the company to $1 billion. GrabTaxi currently operates across seventeen cities in six countries in Southeast Asia. Other investors to support the fast-growing taxi hailing network this year have been Tiger Global Management in the US and Vertex Venture Holdings, a subsidiary of the Singapore government investment arm Temasek. GrabTaxi is currently considered to be the taxi hailing app with the largest network in Southeast Asia. Covering six countries, GrabTaxi (also known as MyTeksi) has over 60,000 taxi drivers registered, serving 500,000 active users, defined as those who use the service a minimum of once per month and 2.5 million downloads. Users can access the same app to hail the nearest taxi in seventeen major cities in the six countries – Malaysia, Singapore, Thailand, Vietnam, the Philippines and Indonesia – as well as view information including estimated fares for their journey, details about the driver and car that will be picking them up such as vehicle registration number and photograph plus trackable taxi rides. A spokesperson for GrabTaxi said that the latest series of investments will be used to fund campaigns to recruit more drivers to the network as well as staffing and marketing campaigns to enable the firm to compete against some of the biggest global players in the market. In terms of passenger numbers, bookings, driver network and usage GrabTaxi are the biggest players in the field, although street hailing is still the strongest competition. The firm will be concentrating on regional expansion and on fortifying efforts in existing locations in order to compete effectively with other taxi hailing apps in the area such as Uber. SoftBank has a strong reputation for investing in both start-ups and fast-growing businesses and is looking at present to invest some $10 billion in start-ups based in India. The past year has seen SoftBank invest $210 million in another taxi app, Ola, plus $627 million in Snapdeal, an online Indian shopping portal. The SoftBank PrinceVille Investment fund, of which Mukesh Valabhji serves on the board, is currently working to place $250 million into between twelve and fifteen growth stage companies looking to expand into the Asian market, with focus on technology companies. Mukesh Valabhji is a prominent global investor from the Seychelles with a number of interests across a variety of business sectors including real estate, hospitality, trading, media and telecommunications. The PrinceVille Fund will benefit businesses bringing social media, gaming, cloud computing, mobile apps, ecommerce and online advertising to Asian markets. In one of the biggest investment pledges in the renewable energy sector in India, SoftBank along with Foxconn and Bharti Enterprises have promised a sum expected to be around $20 billion in solar projects in India, generating a minimum of 20 gigawatts of energy under the remit of the newly-formed company SBG Cleantech. SoftBank will retain majority control of SBG, with Foxconn and Bharti Enterprises as minority stakeholders. Foxconn will also be helping with delivering the planned solar equipment for the project. A fourth-generation Seychellois, Mukesh Valabhji has a long and respected history of investing in a number of business sectors. One of his primary vehicles is the Intelvision cable television, broadband internet and telecommunications service in the Seychelles. He has also made many key investments in commercial real estate within the Seychelles, Singapore and Dubai including premium office strata in the Samsung Hub building within the Raffles Place financial district of Singapore and the Building by Daman in Dubai. A group of investors advised by Mukesh Valabhji are behind the new luxury Six Senses resort due to open on a private island in the Seychelles later this year. The resort will feature 5-star accommodation in premium condominiums and luxury branded residences, waterfront entertainment and dining facilities and much more. The Valabhji family have been involved for more than three-quarters of a century in trading businesses within the Seychelles, operating currently under the holding company of Abhaye Valabhji Pty Ltd, retailing across various lines of business including automobiles, furniture, Yamaha outboard engines, household appliances and much more. Abhaye Valabhji Pty Ltd is spearheaded by the brother of Mukesh Valabhji, Anil. Mukesh Valabhji has been working with SoftBank PrinceVille Investments, using his wealth of investment expertise to help generate further global investment in technology start-ups and growth companies. 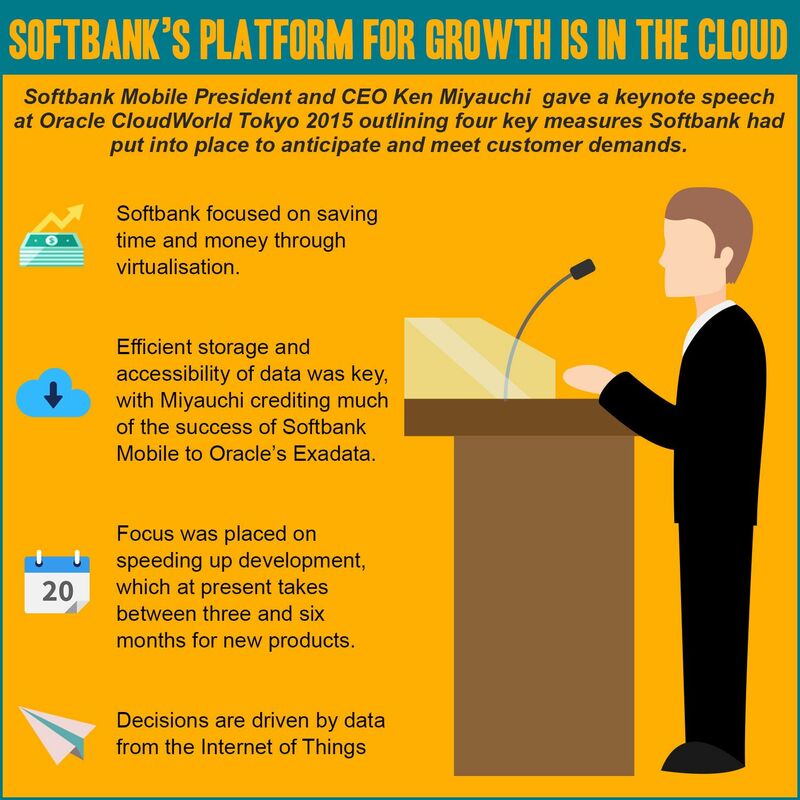 See our previous post to find out what Japan’s Softbank Corp names their new president.